Learn to crew and helm a sailboat. Basic Training Camp is an inclusive and intense 3-day course for active military and veterans to learn and experience sailing through the classroom and on-the-water time in boats. Mornings are for classroom sessions to learn sailing theory and gain the fundamental sailing knowledge you'll use on the water. Afternoon on-the-water time in boats you will apply theory and sail you boat. Each boat has an on board coach supporting your learning and applying your new skills to rig the boat, leaving the dock, maneuver through all points of sail upwind and downwind, and to ensure safety on the water. At the end of the Basic Training Camp, you will know how to successfully crew and manage a sailboat on the water. Participants of all gender, age, and abilities are welcome to participate. It's Free. There is no cost for active military and veterans. We provide qualified coaches and instructors, the training facility, all the equipment, sailboats, and meals. I'm not available all three days of the Basic Training Camp. We'll do this again... ioin us when you have the time. Service animals are accepted at the Basic Training Camp. Dogs are not allowed on the boats. We'll be on the water for approximately 4 hours per day (afternoons), and we can organize a dog watcher for this time while you are on the water. You will be responsible for any additional charges or fees associated with your service animal. Camp sailboats will have 3 participants and an on-board coach. The SanJuan 21 keelboat is a great boat to learn on. Can the sailboats accommodate people with disabilities? We're partnering with the Disable Sailing Association of Alberta for this event. Their Sonar keelboats easily accommodate people with disabilities. If I enjoy sailing, how can I continue sailing after the Camp? Sign up for our Crew List (free) and go sailing with Club members. Take a Start Keelboat Sailing course and then the Keelboat Spinnaker course (discount lesson fees for Basic Training Camp participants). 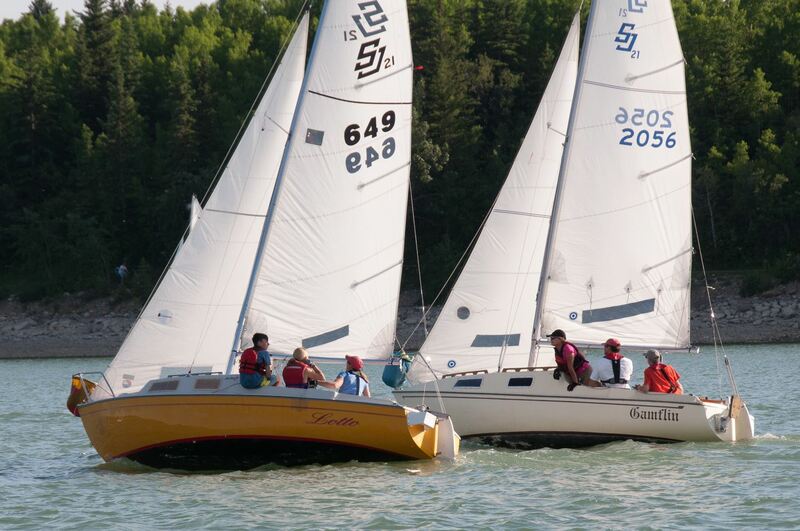 The Glenmore Sailing Club has a fleet of Community Sailboats. Keep sailing on one of our boats.